As the number of dementia cases rises and research into the neurological disorder intensifies, a holistic approach to dementia is being seen as a real benefit. The holistic approach focuses on individualized care and looks at the whole person as opposed to the person’s brain functions alone. It also takes into account the patient’s remaining strengths, emotions, and abilities, instead of just looking at their disabilities. While it is true that as dementia progresses a person loses their ability to express their feelings, studies now suggest that people living with dementia are still able to maintain self-awareness, their sense of identity, and their individuality. Those who care for dementia patients with a holistic approach are able to both analyze a person’s medical and social history, as well as come to a clear understanding of what their preferences are. Holistic care for dementia patients includes working with families and friends to help determine what is best for an individual patient. Four important factors are taken into consideration: determining what environmental triggers might minimize or increase the patient’s level of anxiety, determining what form of communication (verbal, non-verbal, or other) is best for that patient, supporting the patient with nutrient-rich foods, and engaging the person in activities that will allow them to be creative and honor their abilities. When it comes to holistic needs of a dementia patient, food is a big issue. Dementia patients often suffer from lack of appetite, dehydration, malnutrition, and difficulty chewing, but some studies show that sufferers fare much better when they eat with their family or friends. 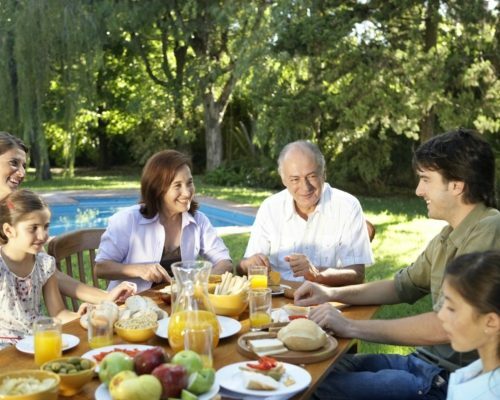 Researchers from Norwich Medical School in the U.K. conducted a study and found that family-style eating meals with caregivers, playing music, and multisensory exercises could help boost nutrition and hydration in those with dementia. The team reviewed research from around the world and examined the effectiveness of over 50 interventions which all focused on improving, maintaining, or facilitating food and drink intake among over two thousand people with dementia. Intervention tests such as changing the color of the plate, increasing exercise, waitress service, playing different music, singing, creating a home-like atmosphere, providing supplements, as well as boosting the social part of eating were conducted. They also looked at whether encouraging eating made a difference, as well as how better education and training for caregivers would impact mealtime. When assessing the factors, the researchers looked at whether the interventions improved hydration, body weight, and overall quality of life. Lee Hooper, the lead doctor involved in the comprehensive study, revealed that a number of the interventions, including music, eating with caregivers, and having social interaction during meals seemed to show positive results. Hooper also pointed out that providing education and support to caregivers – both professional and family members – showed promise as well. The researchers are now suggesting that bigger studies be conducted to fully verify their conclusions. The U.K. experts suggest that a holistic approach involving a mix of what food is consumed, where that food is consumed, and with whom the food is shared, is important for dementia sufferers. Holistic approaches with dementia patients should also take exercise into consideration. Most dementia sufferers experience declining physical ability, along with loss of mental ability. It is believed that exercise can improve both physical and psychological wellbeing. One study conducted in the U.K. showed that a holistic approach involving activities such as yoga, tai chi, qigong, and meditation, along with physical exercise, had a positive effect on dementia patients. The researchers developed a holistic exercise plan that combined physical movements with exercises focusing on emotional, intellectual, and social fitness. In one session, dementia patients participated in a short exercise where they were shown a picture of an object while an instructor talked about that object. The patients were then prompted to discuss the object and ask questions. This was followed up with physical exercises like yoga and easy dance movements. To end off the session, the patients did some guided meditation. After taking part in the exercises, some patients said they felt less anxious and more relaxed, while others reported that it helped them socially. There were even some people who indicated that the session helped them with pain relief. What was really encouraging was the fact that some patients said that learning new exercise was “empowering”. The research team involved in the study noticed that as the sessions went on, not only did the dementia patients enjoy the activities – some showed improvement in memory recall as they anticipated physical movements associated with the music. The team believes that participating in holistic exercise could offer some relief to caregivers as they deal with the many challenges of attending to people with dementia, including physical and psychological stressors. Dementia is a complex condition that is becoming a constant topic of discussion as our population ages. Half of older people who require personal care have some level of dementia. Many of them live in nursing homes, away from family and friends. The risk of malnutrition, dehydration, depression, and physical weakness is high for these individuals. Finding ways to better treat dementia patients, giving them the dignity and quality of life they deserve, will be a major focus of research in the years to come. Holistic approaches will continue to be part of that research.